Because I’m running low on jojoba oil, I decided to stop by the healthfood store this afternoon to purchase some more. Unfortunately they were out of stock of the type I wanted to try (unrefined, so it’s golden in color) so I found myself randomly wandering around the store for something that would catch my eye. Rosewater/Glycerin spray crossed my path. I remembered reading something about rosewater for your face so I figured that must have been pretty good. The glycerin made me pause however. I remembered quite a few curlies saying that it was an ingredient they tried to avoid. After reading the label on the back, it mentioned that the two combined were a great skin moisturizer and could be used alone by spraying on after the shower. I smelled it. Ehh, it smelled like roses…old lady roses. Despite my reservations I decided to purchase it anyway and research it later. I’m so glad I did make the purchase! I’ve found that rosewater is a terrific toner for your face (if you spray it on your face 15 minutes prior to makeup application it helps present a fresh face) and when sprayed in your hair makes it crazy soft! Now regarding the glycerin, depending on the season it can be a miracle worker or a hell-raiser. Glycerin attracts moisture from the air. In the summer it acts as an amazing moisturizer/humectant by drawing on the water molecules that are out and about and putting them into your hair. In the winter however it does the exact opposite. Since there is little moisture in the air, glycerin pulls the water molecules from your hair and deposits them into the air. 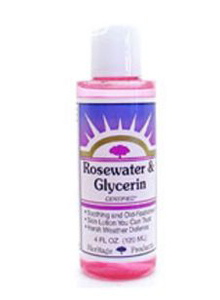 With this being summer, I will be utilizing my rosewater/glycerin spritz into my routine. I imagine that I’ll probably use it on my hair as a quick little pick-me-up when my curls are droopy and/or misbehaving. I’ll let you all know how it goes. I might just have to go cop some (do they still say that phrase?)! I also heard that rosewater is a good base for any homemade products that may call for distilled water:-) Thanks for sharing! And you know I’m gonna have to repost!! Oh, and your scientific assessment of this products is amazing!